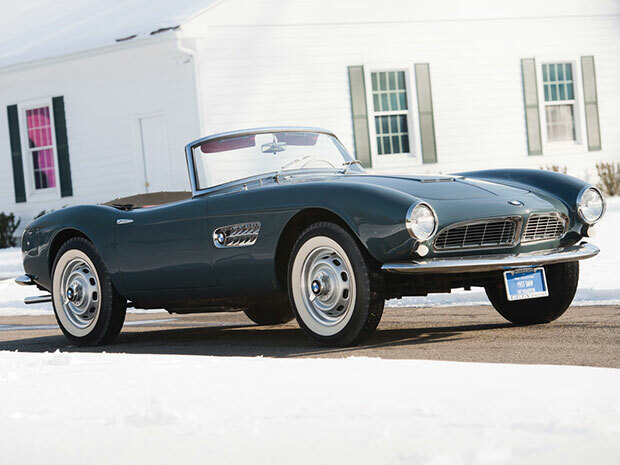 With only two owners in the past 55 years, this impressive 1958 BMW 507 Series II Roadster has a rather impressive history. Max Hoffman was always an avid BMW enthusiast, and in the 1950’s he challenged the BMW Company to make a better, more luxurious version of the Mercedes Benz 300 SL model. Hoffman thought that this would be a great design to offer to the uber-wealthy rich in a post-World War II America. Because Hoffman was already the most successful importer of his time from the United States, BMW took the challenge. Had it not been for Hoffman, this Convertible Roadster would never have seen the light of day. With its cat-like curves, powerful V8, and unique side louvers that look like the gills of a shark, the newly designed 1958 BMW 507 Series II Roadster commanded the super high price of $11,000. Remember, this was 1958! Today, it is expected to command in upwards of $1.8 million at auction. Other impressive features include a live rear axle complete with torsion bars, hydraulic rear drum and front disc brakes, a 4-speed manual transmission, and an independent front end suspension. The current model even boasts the original V-8 engine, as verified by the BMW Company themselves.